The International Centre for Integrated Mountain Development (ICIMOD) Board of Governors comprising government representatives from eight member countries of the Hindu Kush Himalayas namely Afghanistan, Bangladesh, Bhutan, China, India, Myanmar, Nepal and Pakistan, as well as seven independent members along with ICIMOD Support Group (ISG) met in Kunming of China 24-30 November 2015. The group visited Erhai Lake in Dali to experience wetland restoration, management and livelihood development partnership between Yunnan Institute of Environment Science and ICIMOD under its Himalayan Climate Change Adaptation Programme (HICAP) supporting the local Government authorities. The field visit saw stakeholder and government interactions in addition to the review of restoration and livelihood activities on the ground, a gesture highly appreciated by the Board. Partners’ Day was observed on 27 November where various programmes’ progress in China were highlighted. Priority areas of work were identified and a way forward discussed. Board and ISG members interacted with ICIMOD China partners giving direction for future programmes. 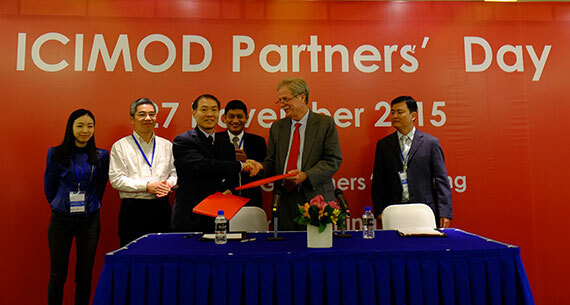 During Partner’s day, two MoUs were signed, one with Chinese Committee on International Centre for Integrated Mountain Development (CNICIMOD) to strengthen collaboration in China, and one with the Chinese National Science Foundation to facilitate joint mountain research between ICIMOD and Chinese partners. Various sub-committee meetings of the Board, namely the finance committee and Programme Advisory Committee (PAC) dwelt on details regarding financial and programmatic issues. During the PAC, topics on resilience, SDGs, Policy Approach for ICIMOD and private sector engagements were discussed. The ICIMOD Support Group discussed the ‘Joint Financing Guideline’ and the Quinquennial Review (five yearly independent view) roll over Foundation activities into ICIMOD’s work, and gradually phase out the Foundation. The full Board approved 2015 Progress Report and Annual Plan & Budget 2016 for ICIMOD. Decisions included a change of the cycle of Board meetings from November/ December to May/June 2017 for efficiency in reporting and the approval of the proposal of ISG on the appoint of Dr Teresa Fogelberg as new Independent Board member. The Board appreciated the contribution of Dr Lars-Erik Liljelund who served as Chair of PAC and Vice-Chair of the Board. The Board also welcomed Dr Margaret Catley-Carlson as the new Chair of PAC and Vice-Chair of the Board.